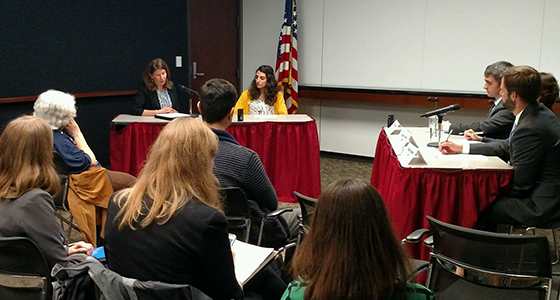 Dozens of health professionals testified earlier this month in Chicago at the only public hearing on the EPA’s Affordable Clean Energy Rule, the proposed replacement for the Clean Power Plan. Among them was Katie Wickman, RN, sustainability manager for Advocate Aurora Health, who testified on behalf of her health system. Dr. Peter Orris, professor of occupational and environmental medicine at the University of Illinois School of Public Health, also testified on behalf of Health Care Without Harm and Chicago Physicians for Social Responsibility. “As a physician pledged to my patients’ and the public’s health, I strongly oppose the proposed step backward in our efforts to reduce toxic air pollution represented by this gutting of the Clean Power Plan. This proposal will additionally hinder our efforts to mitigate climate change. It ignores the excellent science that clearly points to premature deaths from these dangerous air pollutants,” Orris said. Health Care Without Harm has joined with leading health organizations in opposing the proposed replacement for the Clean Power Plan. This proposal would cause illness and premature death from other dangerous air pollutants and move the nation backward in the fight against climate change. EPA's own analysis of the proposal found that it could result in up to 1,400 more premature deaths, 120,000 more asthma attacks, and up to 64,000 missed days of school annually by 2030, all of which would be prevented under the existing Clean Power Plan. In addition to the immediate damage this proposal would cause to human health, failing to address the pollution causing climate change will have lasting health consequences. The longer our nation's leaders delay action to clean up the pollutants driving climate change, the greater the health costs will be from wildfires, hurricanes, and other extreme weather events. Join with leading health organizations and health professionals nationwide in opposing this dangerous proposal. Submit comments urging the EPA to fully implement the Clean Power Plan to save lives by Oct. 31.